to major and minor services. With many mall based locations, Kwikfit offers customers the opportunity to see to all their cars needs while they shop! Let us take care of your car while you take care of everything else. 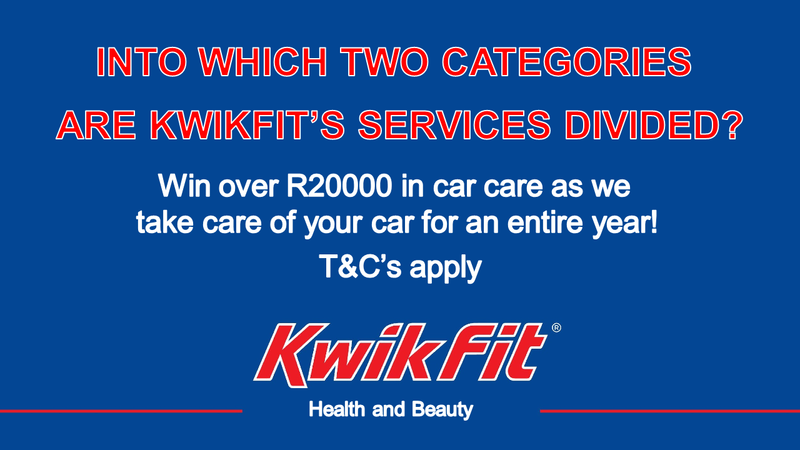 Kwikfit has over 30 years of presence within South Africa. Originating from the UK, this One Stop Service Shop provides customers the opportunity to see to ALL their car needs under one roof. With the fully-fledged branches offering health services such as: major and minor servicing, exhausts, batteries, shocks, etc, as well as beauty services such as: car wash, dent and scratch repair, rim and headlight refurbishment etc. Kwikfit has ensured that car maintenance be as simple, easy, and convenient as possible. "Hello For the last 1year 6 months since I had stepped into Kwik Fit, Killarney (JHB) it defiantly was the best thing ever. I have received nothing but the most amazing service and nothing short of professionalism and a customers best interest and not been taken advantage off. On Monday I had taken my car in for alignment, and was helped by the most amazing staff. Leonie (branch manager), Wayne (branch manager), Tau (sales), and Menzi (wheel alignment technician) were extremely helpful and where the most out of this world service. I have always been amazed by the most amazing service from Leonie, Wane and the Kwik Fit Killarney team. I will continue to go back to them for the most amazing service. If I am worried or stressed, it is quickly reassured and it is taken care off by them. They go out of their way for their clients and when you walk in you defiantly not just a person walking in but you actually someone who is walking into the most amazing service team. With been with them for the last year and a half, has been the best service ever and will not be going anywhere else when I get the best, most outstanding service ever from a team who is really passionate about what they do, they go out of their way and the extra mile and their knowledge is just shockingly amazing!!! Thank You so much to Leonie, Wayne and the Kwik Fit Killarney team for always been the most amazing team!!!" We are always on the lookout for new franchisees & franchising opportunities! If you’re interested in joining the Kwikfit brand simply follow the link below.